After a couple of games you might be interested in expanding your Tollblood army (as I was), and for that case you find some suggestions below. Personally, I don't decide exclusively only in terms of most value for a tournament for example - for me it's also important to have fun when playing with certain miniatures, and last but not least to "like" the miniatures (and their look). 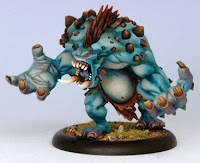 To enhance the possibilities concerning warbeasts (and to add a powerful model which can absorb a lot of damage) I chose a Dire Troll Mauler - I REALLY like this model. 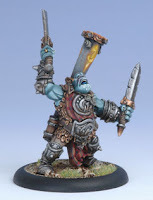 Regarding to the first units I suggest counting on the Trollblood Champions - they are tough and support each other pretty well, maybe one of the best units in the game. Additionally the Krielstone Bearer unit might be also worth to have a look at. Not only the idea of the Krielstone itself is great (find more information below), they also can boost the stats of the Trollkin Champions. If you want to add a solo unit as well, mabye the Fell Caller might fit your needs - his fell calls are very useful (either for the Fell Caller himself or to help out warbeasts or any other warriors). With bodies of thickened muscle and clawed hands nearly the size of a man, there are few creatures more awesome than the Dire Troll. When these monsters came from the forest in ancient days to stuff their fanged maws with screaming victims, it was proof to the primitive tribes of man that terror had flesh and walked among them. 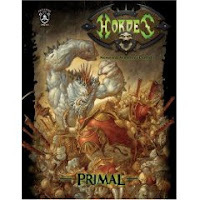 They bring tremendous raw power to the allied Trollkin Kriels. The champions are hardened veterans, rising as the great heroes of their kriels. A tight bond links them to one another, an awareness that theirs is a greater destiny. They formalize these ties with the kulgat blood oath, learning to draw strength from their brothers and fight with seamless precision side by side. They distinguish themselves on the front line, hacking into enemies with a weapon in each hand, inflicting grievous wounds. Among the Trollkin kiths, it is considered a great honour to have the strength to bear sacred Krielstones into battle. Powered by carefully inscribed runes immortalizing Trollkin heroism over the ages, the stones radiate powerful protection to the brave warriors nearby. Few trollkin warlocks willingly take the field without one of these peerless warriors. Incarnations of their culture, Fell Callers serve as rallying points that bolster their fellows with powerful fell calls and lay their enemies low with paired swords. No trollkin can resist following when a Fell Caller drives deep into the enemy.